Part of the reason stems from the absence of any mechanism for “the world” to come together. The United Nations General Assembly comes closest, but little can be expected from an organization that equates the United States or China with, say, Fiji or Guinea-Bissau. To be fair, those who founded the UN after World War II created the Security Council as the venue in which major powers would meet to determine the world’s fate. But even that has not worked out as planned, partly because the world of 2013 bears little resemblance to that of 1945. How else could one explain that Britain and France, but not Germany, Japan, or India, are permanent, veto-wielding members? Alas, there is no agreement on how to update the Security Council. Efforts like the G-20 are welcome, but they lack authority and capacity, in addition to suffering from excessive size. The result is “multilateralism’s dilemma”: the inclusion of more actors increases an organization’s legitimacy at the expense of its utility. No amount of UN reform could make things fundamentally different. Today’s major powers do not agree on the rules that ought to govern the world, much less on the penalties for breaking them. Even where there is accord in principle, there is little agreement in practice. The result is a world that is messier and more dangerous than it should be. Consider climate change. Burning fossil fuels is having a measurable impact on the earth’s temperature. But reducing carbon emissions has proved impossible, because such a commitment could constrain GDP growth (anathema to developed countries mired in economic malaise) and impede access to energy and electricity for billions of people in developing countries, which is unacceptable to China and India. Stopping the spread of nuclear weapons would seem a more promising issue for global collaboration. 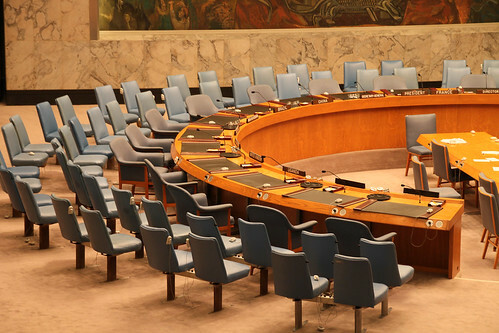 The Nuclear Non-Proliferation Treaty (NPT) limits the right to possess nuclear weapons to the Security Council’s five permanent members, and then only temporarily. But agreement is thinner than it appears. The NPT allows countries the right to develop nuclear energy for purposes such as electricity generation, a loophole that allows governments to build most of what is necessary to produce the fuel for a nuclear weapon. The inspection regime created in 1957 under the International Atomic Energy Agency (IAEA) is a gentlemen’s agreement; inspectors can inspect only those facilities that are made known to them by the government in question. Governments (such as Iran’s) can and do carry out illegal nuclear activities in secret sites that international inspectors either do not know about or cannot enter. At least as important, there is no agreement on what to do when a country violates the NPT, as Iran and North Korea (which withdrew from the treaty in 2003) have done. More international cooperation exists in the economic realm. There has been real progress toward reducing tariff barriers; the World Trade Organization has also established a dispute-resolution mechanism for its 159 members. But progress on expanding free trade at the global level has stalled, as many countries disagree on the treatment of agricultural goods, the elimination of subsidies, and trade in services. Meanwhile, cooperation in the realm of cyberspace is just getting started – with difficulty. The US is most concerned about cyber security and the protection of intellectual property and infrastructure. Authoritarian governments are more concerned about information security – the ability to control what is available on the Internet in order to maintain political and social stability. There is no agreement on what, if anything, constitutes an appropriate target for espionage. The prevalence of non-state actors is further complicating efforts. Another area where there is less international community than meets the eye is human suffering. Governments that attack their own people on a large scale, or allow such attacks to be carried out, expose themselves to the threat of outside intervention. This “Responsibility to Protect,” or R2P, was enshrined by the UN in 2005. But many governments are concerned that R2P raises expectations that they will act, which could prove costly in terms of lives, military expenditure, and commercial priorities. Some governments are also worried that R2P could be turned on them. Russian and Chinese reticence about pressuring governments that deserve censure and sanction stems partly from such concerns; the absence of consensus on Syria is just one result. In short, those looking to the international community to deal with the world’s problems will be disappointed. This is not reason for despair or grounds for acting unilaterally. But so long as “international community” is more hope than reality, multilateralism will have to become more varied. In the trade area, this implies regional and bilateral accords. On climate change, it makes sense to seek “mini-agreements” that set minimum common standards for fuel efficiency, slow deforestation, or limit the largest economies’ carbon output. In these and other areas, governments will need to rally around regional undertakings, form coalitions of the relevant or willing, or simply seek understandings among countries to do their best to adopt common policies. Such approaches may lack the reach and legitimacy of formal global undertakings, but they do have the advantage of getting something done. Richard N. Haass is President of the Council on Foreign Relations and the author, most recently, of Foreign Policy Begins at Home: The Case for Putting America’s House in Order.